Detailing the physical features, habits, territorial reach and other identifying qualities of the Nason's Slug. The oblong, spiky, green larvae of Nason's Slug garner far more attention than its brown adult form. Slug Moths are more commonly recognized as caterpillars thanks to their unusual shape and form. Like their name suggests, caterpillars resemble slugs. Nason's Slug is shaped like a green oval. A central row of white markings resembling spades (from cards, not the shovel) extends the length of the 'spine'. A raised yellow ridge borders the left and right side of the top body. Red-orange bumps projecting short spines run along these yellow ridges. 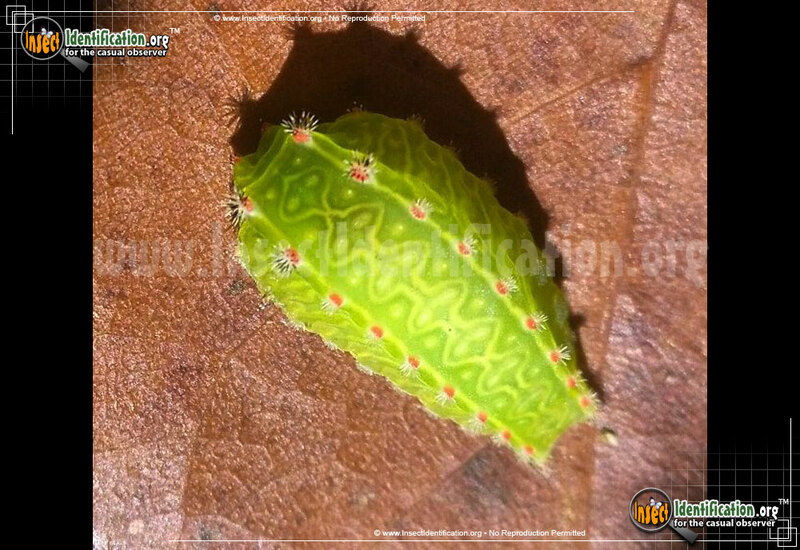 Clumps of short spines also decorate the base of the entire caterpillar. These short spines are stinging hairs that can cause pain and leave redness in areas where they contact skin. Larvae feed of the leaves of beech, chestnut, hickory and hornbeam trees. Adults are light brown. Each forewing has two angled dark brown lines. The hairy thorax may be brown or shades of orange.